The best part of these tablescapes? The majority of the elements required can be found in your craft drawer or right outside your home, making these DIY projects ultra easy and ultra affordable. Get ready to channel some elegant barn vibes. First, use a yard or so of your favorite unhemmed flannel fabric as your table runner (check at a local fabric store for deals). Iron it to remove the wrinkles, but don’t stress about imperfections. 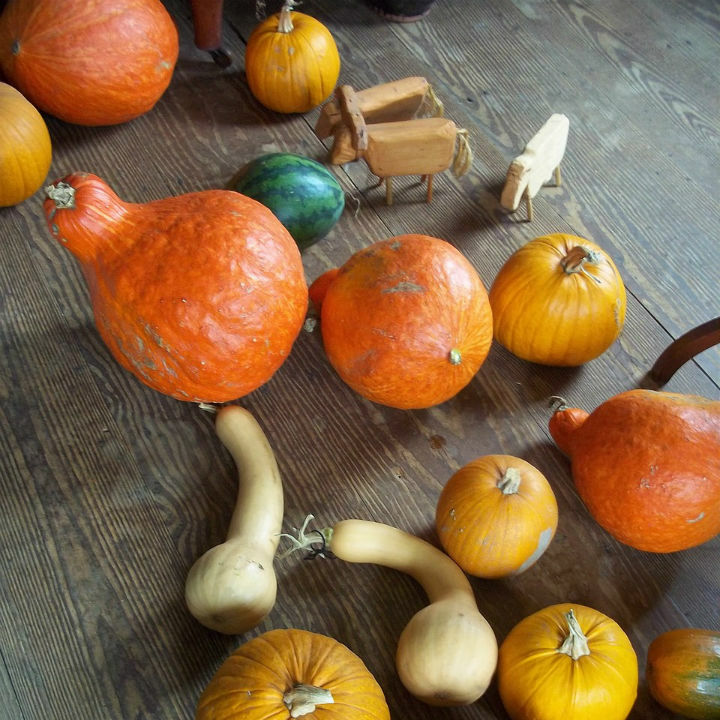 Then, layer small gourds and tiny pumpkins down the runner, interspersing candle tumblers and even a few small pumpkins as you see fit. Next, head out to your backyard with sheers in-hand. Cut a few branches from a nearby fruit tree (such as a plum with small dried fruit still attached). If any dead flowers or leaves remain on the branches, keep them there! Their colors will add a beautifully imperfect touch. Lay the branches between the pumpkins and more candles. Finish the look with the necessities: layering rattan chargers, plates, silverware, and napkins. If you’re looking to brighten up your Thanksgiving table, opt for a tablescape with a fresher look. Dress bowls or baskets with any combination of apples, lemons, limes, oranges and acorn squash. Using a white table runner, disperse silver dollar eucalyptus and potted baby’s breath. Next, place preserved boxwood bowls over the eucalyptus. If you have more citrus and acorn squash on hand, use them to fill in the areas that look sparse. Once again, finish the look with the necessities: layering glassware, plates, silverware, and napkins. Nothing beats a classic fall table. Start yours by placing a solid table runner of your choosing (fall or cream colors only) across your table. Follow with a bed of magnolia tips directly on the table runner fabric. Then arrange acorn squash around the magnolia tips. Grab your favorite mercury glasses (silvered glass candle holders that do not actually contain mercury or silver) and disperse them down the table, placing an individual soy wax candle/melt in each one. 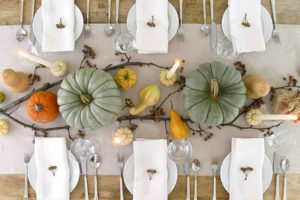 Scatter remaining acorns and mini gourds as you see fit to fill the holes on your tablescape. Then complete the look with tall, white unscented candles. Let their wax drip directly onto the runner for a vintage touch on a classic table. For an even more interesting combination of shapes and textures, fill the runner with silver dollar eucalyptus leaves, star pods and squash. Insert extra touches of green, incorporate geodes, leaf skeletons or air plants. Complete the table by filling glass jars with hazelnuts supporting long, thin unscented candles. Additional Hint: Use a Scrigit Scraper cleaning tool to remove candle wax from candle holders and other surfaces. It is safe to use on most surfaces, but test in an inconspicuous spot on wood and other softer surfaces. Contributed by guest blogger Cyndi G.